Since 1996, ProFauna Indonesia has conducted regular monitoring on the wildlife traded in the bird (animal) markets in Java and Bali Islands in order to gather the latest number of the trade for the organisation to support its campaign and law enforcement. 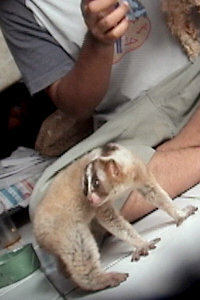 In 2011, the average of the primate trade in the aforementioned eight markets is 85 individuals per month. The species included the long-tailed macaques (Macaca fascicularis), the Javan langur (Trachypithecus auratus), and the slow loris (Nycticebus coucang). 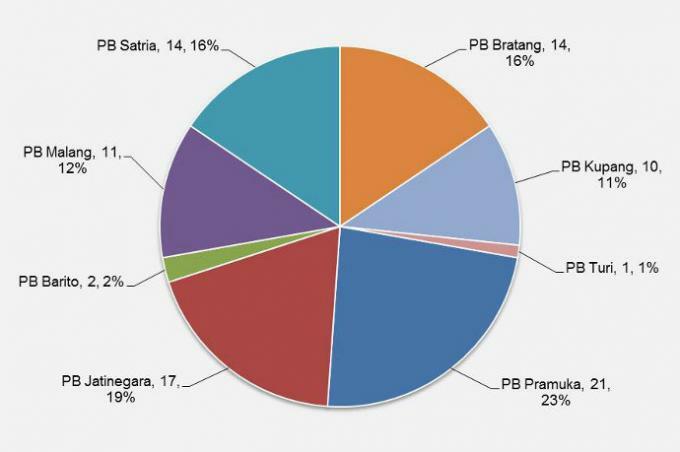 The bird market which sold primate the most was Pramuka market and seconded by Jatinegara market. 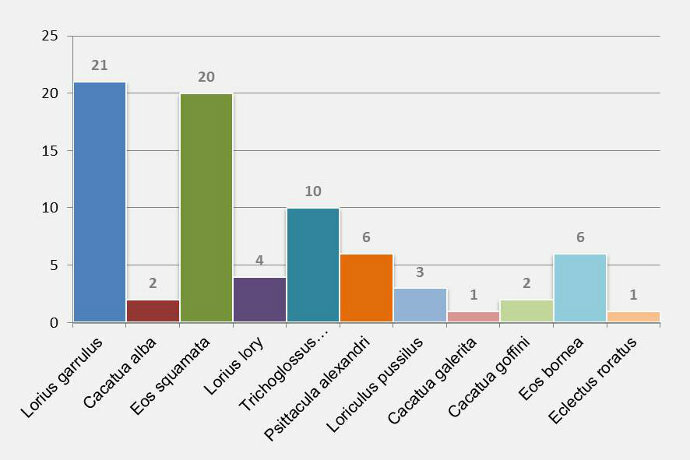 The most traded primate species was the slow loris: 12 individuals per month. The monthly average of the parrot trade in 2011 was 76 birds. There were 11 species included: the Chattering Lory (Lorius garrulus), the White Cockatoo (Cacatua alba), the Violet-necked Lory (Eos squamata), the Black-capped Lory (Lorius lory), the Rainbow Lorikeet (Trichoglossus haematodus), the Yellow-throated Hanging-parrot (Loriculus pussilus), the Red-breasted Parakeet (Psittacula alexandri), the Eclectus parrot (Eclectus roratus), the Red Lory (Eos bornea), the Goffin Cockatoo (Cacatua goffini), and the Sulphur-crested Cockatoo (Cacatua galerita). The bird market selling parrots the most was Pramuka market in Jakarta and seconded by Bratang market in Surabaya. While the market selling parrots the least was the bird market in Malang. The illegal wildlife trade (excluded primate and parrot species) in 2011 remained high. There were 21 protected individuals sold every month on average in the markets. 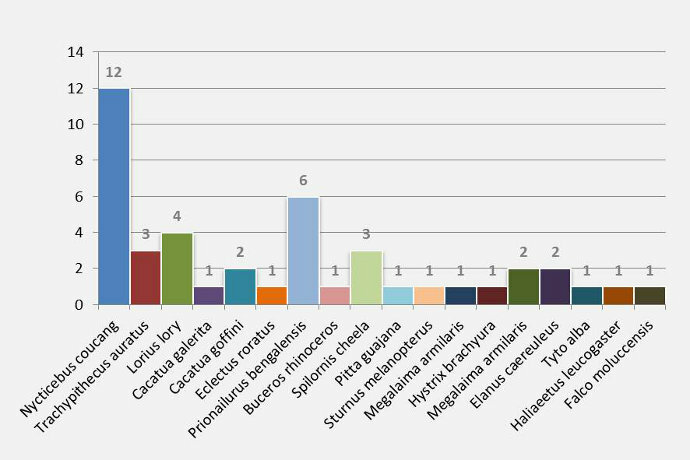 There were 12 protected species included: the Crested Serpent Eagle (Spilornis cheela), the White-bellied Sea Eagle (Haliaeetus leucogaster), the leopard cat (Prionailurus bengalensis), the Black-winged Kite (Elanus caereuleus), the Rhinoceros hornbill (Buceros rhinoceros), the Banded pitta (Pitta guajana), the Malayan Porcupine (Hystrix brachyura), the Black-winged starling (Sturnus melanopterus), the Barn owl (Tyto alba), the Flame-fronted Barbet (Megalaima armilaris), and the Spotted Kestrel (Falco moluccensis). The total number of the illegal wildlife trade (including the protected primates and parrots) was 44 of 17 species. For further information please contact us at the following emails: rosek@profauna.net or international@profauna.net.